The KISS principle (Keep It Simple Stupid) is cute but keeping anything simple keeps us stupid. While I contend that this idea is true in every aspect of our lives let’s test its validity by looking at one event in History that we know about, or think we know about – the Emancipation Proclamation, Lincoln’s freeing of the slaves. The document is far too often simplified beyond recognition. In so doing, in robbing it of its complexity, History itself is deprived of its ability to do what it exists to do, to act as a wise teacher invoking yesterday in an invitation to better understand today. 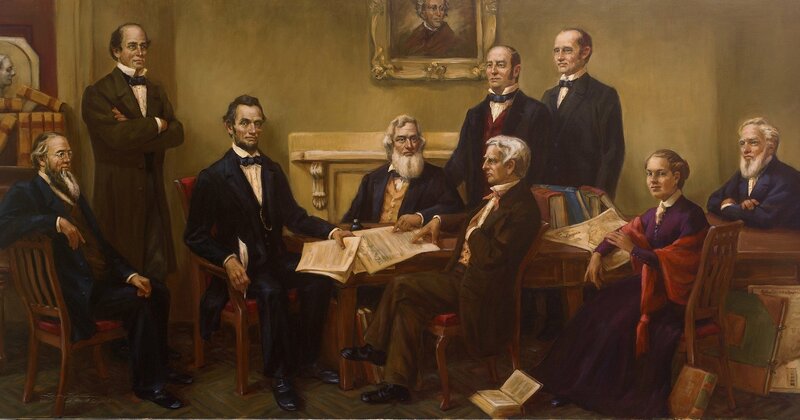 So let’s test the idea with a consideration of the lessons offered by Lincoln’s 1863 Emancipation Proclamation. Lincoln was a visionary but he was also a pragmatist and hard-nosed realist. The American Civil War began with the shelling of Fort Sumter in April, 1861 and for a year Lincoln’s Northern armies lost nearly every major battle. With each bloody month the costs mounted, the astounding number of casualties tore families, support for Lincoln and the war waned, and Britain threatened to tip the balance by entering on the side of the Confederate South. In the summer of 1862, with everything falling in tatters about him, the president told his incredulous cabinet that he wanted to free slaves in states still in rebellion. The notion met with unanimous opposition. Lincoln swayed them by arguing that he was motivated not by a moral imperative but by military expediency. His stated goal in going to war in the first place, after all, had not been to end slavery but to preserve the union. Freeing slaves now, he told his dubious cabinet, would help pursue that goal by helping to crush the South. The act would allow for the creation of so-called ‘coloured’ regiments to bolster the North’s faltering recruitment efforts. It would stir havoc in the South as even more slaves were inspired to escape. After all, the Proclamation would mean nothing if the North lost the war. Further, the Proclamation would dissuade Britain from offering aid or diplomatic recognition to the Confederacy. Having banned slavery decades before, he reasoned, Britain could hardly be seen supporting the peculiar institution in a war now redrawn as about good versus an evil. The cabinet relented but persuaded Lincoln to postpone announcing the Emancipation Proclamation until a Union victory was won so that it would not appear to be an act of military desperation. When Lee’s Confederates were not really defeated but at least repulsed at Antietam in September 1862, Lincoln claimed the battle as the victory he needed. 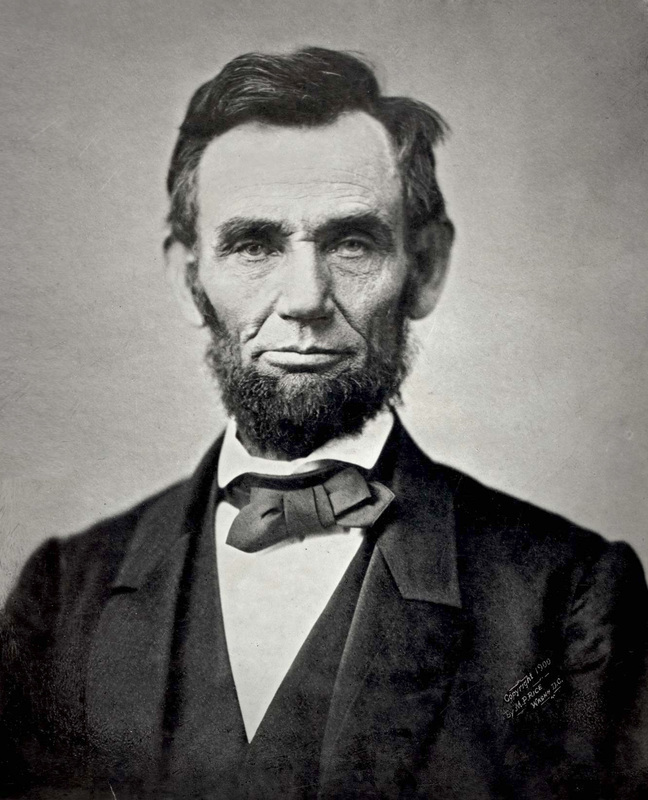 He publicly announced that he would sign the Emancipation Proclamation on January 1, 1863. The Proclamation freed some but not all the slaves. 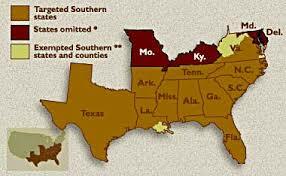 It allowed slavery to remain in the Border States of Delaware, Maryland, Kentucky, and Missouri. To end slavery there, Lincoln believed, would possibly end their neutrality and spur them to join the South. The act also exempted parts of the South that had already come under Northern control for those areas were chaotic enough without adding the crush of runaway slaves seeking the protection of the Northern army. Also limiting Lincoln’s action was that it was not a constitutional amendment or even a law for he could not have won or waited to win those victories. It was merely a Proclamation that could be more easily ignored at the time or later. Despite its limitations, the Proclamation changed everything. It meant that with the Civil War’s costs and casualties mounting and Lincoln’s fragile alliance of Republicans, abolitionists and northern Democrats fraying, the struggle was suddenly about something greater than the preservation of a political state. From that point forward the war would be about an idea. It would be about freedom. It would be about the very concept of humanity. The Declaration of Independence had insisted that all men are created equal but the Emancipation Proclamation stated an intention to transform that aspiration to a fact. Millions of people who for over 200 years had been property could become human. Northern abolitionists and radical Republicans applauded the Proclamation. Britain initially reacted with skepticism but then responded as Lincoln had hoped. Gone was talk of Britain entering the war on behalf of the South or of its recognizing the Confederate government. “Colored Regiments” were formed beginning with enlistment to Boston’s famous Massachusetts 54th. Eventually about 200,000 African Americans donned the blue uniform. Lincoln said their contributions and numbers represented a turning point in the war that could have been lost without them. But all were not happy. Not surprisingly, the South was outraged. From the Southern point of view the Proclamation was useless as it was merely an act by a foreign leader with no jurisdiction in what it insisted was a newly formed and sovereign state. It was another example of what many were fighting about – a far-away federal government insulting the Southern way of life and attacking the economic foundation of their society. There was more rage when, as Lincoln had predicted, the number of slaves escaping from Southern plantations rose. There was also consternation among many in the North. Editorials attacked Lincoln for changing the aim of the war arguing, quite rightly, that it had never been about abolition. The Copperheads, a loose amalgam of northerners who wanted peace at any price, said that even though the war was now about freeing slaves that the cost was still too high. They increased their efforts to defeat Lincoln in 1864 and to negotiate an end to the war with slavery in place. Hundreds of Union soldiers deserted. They claimed that they had not signed up to free slaves. Lincoln’s commanding General George McClellan was advised to stage a coup. McClellan refused to do so but a year later he accepted the Democratic Party’s nomination to run against Lincoln for the presidency. The Proclamation also affected Canada. Britain had declared itself neutral in the war and so Canada and the Maritime colonies were automatically neutral as well. But then as now Canadians were a cantankerous lot who considered dictates as merely suggestions. Many were disappointed when Lincoln did not immediately free the slaves upon becoming president and so supported the South. The majority of Canadian newspapers were pro-Confederate. Many Quebecers identified with Southern interests fighting a government that seemed unsympathetic to their beliefs about a threatened culture. Many Canadians and Maritimers saw business advantages and believed that Canada would be more militarily secure with a shattered United States and so supported the South. Two members of parliament who ran into the Canadian legislature shouting that the South had won the war’s first battle at Bull Run were welcomed with a loud cheer. However, even given all of this, newspaper editorials throughout Canada and the Maritimes were unanimous in their praise for the Emancipation Proclamation. It spurred a new wave of Canadians and Maritimers to cross the border and join the thousands of their countrymen who had already enlisted. The vast majority, ironically given pro-Southern sentiment in official circles, fought with the Union. Among those heading south to fight for the North were hundreds who had escaped as slaves but were returning as men. Approximately 40,000 Canadians and Maritimers served in the Civil War. They fought in every major battle and 29 won Congressional Medals of honour. The legitimate fear of American attack or annexation grew more acute with the Emancipation Proclamation because it was, as Lincoln expected, a boon to his cause. Six months after its enactment, the Confederacy was broke and nearly broken. Union victories at Vicksburg and Gettysburg altered the war’s trajectory as surely as the Proclamation had recalibrated its moral imperative. With the Union victory more certain than ever and many Canadian leaders sure that once the South had been dispatched that Lincoln would march his armies north, the impulse to act became acute. Confederation had been talked about for years but it was suddenly a necessity. Canada needed to invent itself to save itself. Plans were made to meet in Charlottetown in September, 1864 to forge a new country. Abraham Lincoln understood the enormity of what he had done. Upon affixing his signature to the Emancipation Proclamation he said, “If my name ever goes into history it will be for this act.” We owe it to ourselves to pause and reflect upon the Proclamation for the milestone it represents in the evolution of mankind’s freedom. But in considering what it was we should also accept what it was not. We should consider the role it played not just in the re-imagination of America but also in the birth of Canada. We should also consider the Emancipation Proclamation as an example of how we must invite History to teach us lessons that resonate today and that in order to properly learn those lessons we must dismiss the balm of simplicity and welcome, in fact, demand complexity. Complexity, after all, is History’s highway to the truth. In fact, complexity and truth are reliant upon each other in every sphere of our lives.